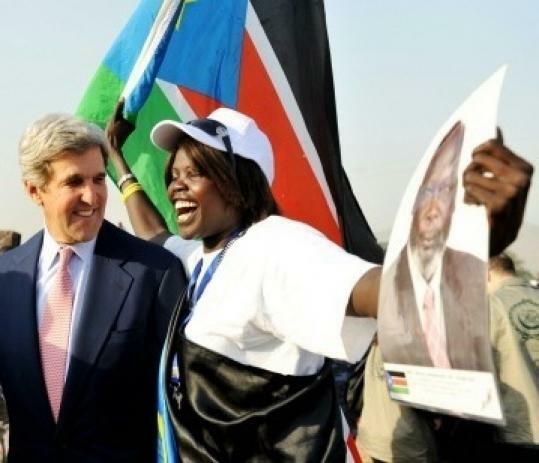 Senator John Kerry, who has worked for months to prevent an outbreak of renewed civil war in Sudan, watched yesterday as millions in southern Sudan lined up to vote for the creation of an independent country in a largely peaceful — and historic — referendum. The Massachusetts Democrat has traveled three times to Sudan since October, relaying carefully worded messages from President Obama’s administration aimed at staving off a new outbreak of violence. A decades-old conflict between the north and south has already taken the lives of some 2 million people. So far, it appears that Kerry’s efforts — along with the work of other envoys from the United States, Europe, and Africa —have worked. Despite some skirmishes in the border town of Abyei, dire warnings of a potential explosion of ethnic tension appear to have been overblown. The weeklong referendum began despite assertions from some analysts that not enough preparations had been done. “They were flat wrong,’’ Kerry said by telephone from Jerusalem, where he stopped to have dinner with the Israeli prime minister, Benjamin Netanyahu, on his way back to Washington. Much of Kerry’s efforts in Sudan have centered on presenting the Obama administration’s offer of incentives to Arab leaders of the north, including removal from the state sponsors of terrorism list, to encourage them to accept the loss of a third of their territory and a significant portion of their oil. Yesterday, Kerry seemed optimistic that the possibility of renewed war had been averted. “I think the fundamental judgment of both the north and the south is that war will not benefit either of them,’’ he said. But he acknowledged that thorny issues remain, such as demarcation of borders, determining citizenship, and sharing of oil revenue. “There is potential for misunderstanding, for mistakes, for bad politics,’’ he said. Kerry said the successful referendum in the south has the potential to change the dynamics in the entire war-torn region, as well as in Darfur, an area in western Sudan where a separate insurgency against Khartoum was crushed by government-backed Arab militias that launched extermination campaigns that have been widely viewed as genocide. He said the peaceful vote in the south could bolster peace in Darfur, providing momentum to peace talks and helping the international community single out those who have been dragging their feet on a peace agreement. “I believe Darfur can be resolved,’’ said Kerry, who traveled to the troubled region on Friday. Yesterday, Kerry marked the historic moment with a speech that quoted Scripture at a packed cathedral in Juba, the capital of southern Sudan, a region the size of Texas that is poised to become the world’s newest country. “As a Catholic and person of faith, and person in public life, I can’t help but feel the relevance of what brings us here to this place of worship and what brings us to the challenge of building a nation,’’ he told a standing-room-only crowd. Yesterday morning, Kerry visited the mausoleum of John Garang, the southern rebel leader who articulated a democratic vision for Sudan who was killed in an airplane crash in 2005, in Juba. Then he toured polling stations, talking with people who had waited in line all night to vote. At the Kator Cathedral, he sat beside Salva Kiir, the president of southern Sudan, and gave Kiir a cowboy hat. “Good luck to you all and godspeed on the journey ahead,’’ he told the audience. This story was filed from Kandahar, Afghanistan, where Farah Stockman spoke with Senator Kerry by phone. She can be reached at fstockman@globe.com.